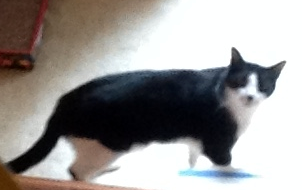 Back in August, Jo, the human companion of Jaffa—the cat who, her blog assures us, turns the page while she reads the big words—asked me to contribute to her feature, Hist Fic Saturday. The post went up last week, and you can go directly there by clicking the link or just read on. 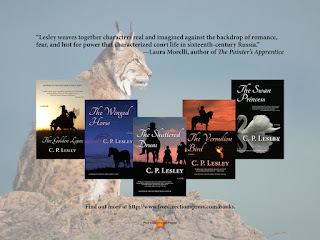 The question she asks authors to answer is “Why do I write historical fiction?” My answer follows, but don’t forget to check out Jo’s blog, where she also reviews historical fiction, including The Golden Lynx. Can never get enough books, right? Especially when someone is happily winnowing the wheat from the proverbial chaff on your behalf. And of course, a huge thanks to Jo and Jaffa—and Timmy, Jaffa’s young apprentice, to borrow a term from Star Wars—for hosting me on their site. It was a fun post to write, and I’m grateful for the prompt to think about these questions as well as for the lovely review of my novel. Images: Sheksna River in mist © 2009 Michael Clarke CC 2.0 via Wikimedia Commons; Legends of the Five Directions advertisement © 2018 C. P. Lesley. 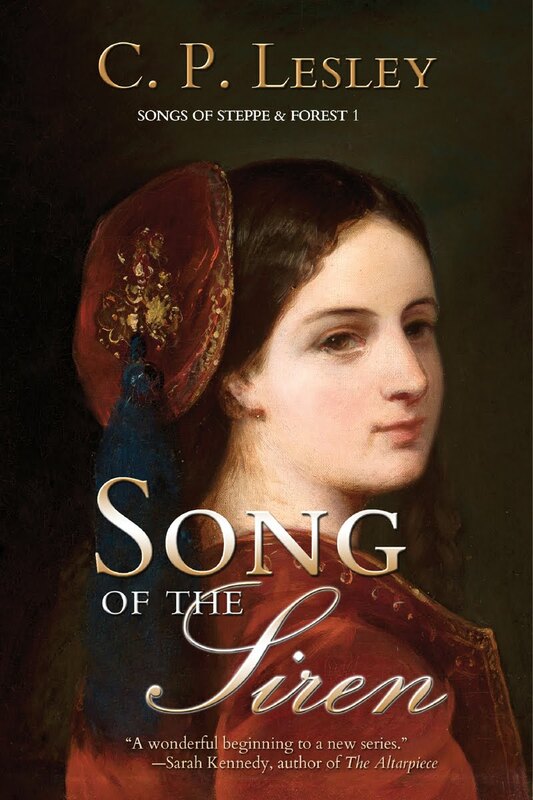 Today I’m honored to present a guest post by Kate Braithwaite, a wonderful historical novelist whom I first encountered as an interview guest on New Books in Historical Fiction. And since she has many interesting things to say, I’ll get out of her way and let her take it from here. But do page down to the end to find out more about her, including her books, her webpage, and her social media links. Thank you, Kate, for this great post! I like writing books set in places of confinement. Maybe it’s because I loved every moment of reading The Count of Monte Cristo as a teenager on holiday in the Pyrenees, refusing to go sight-seeing because I needed to keep reading. Or maybe it’s because I found Papillon in my grandfather’s bookshelves and read it under the covers at night, shocked and amazed by the story that unfolded, as well as by the fact that my grandpa would read such a book. So many factors influence writers, but in this case I see a direct link between my teenage reading and the books I write. I still always love stories set in places of isolation or confinement—prisons, asylums, islands, even lighthouses—and so it’s no surprise to find this reflected in my historical fiction. 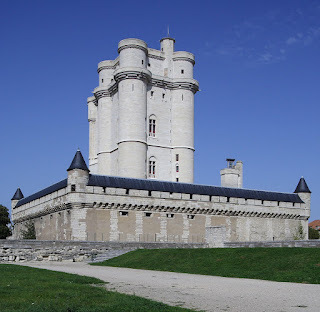 One of the oldest royal residences in France, Chateau de Vincennes has been in existence since the 12th century. It was highly fortified by thick walls and still features a high donjon (a tower, eight floors tall) built in the 14th century as a residence for Charles V. In the mid-17th century, approaching the period of my novel Charlatan, it was one of many building projects entrusted to the architect Louis Le Vau and became the residence of Cardinal Mazarin, Louis XIV’s most trusted adviser until his death in 1661. But Chateau de Vincennes was also regularly used as a prison. During the Affair of the Poisons, when a sprawling investigation into poisoning and witchcraft threatened to engulf Louis XIV’s court in scandal, Chateau de Vincennes became the key holding place for those arrested. Police chief Nicholas La Reynie visited Vincennes frequently, conducting interviews and interrogations, prior to taking prisoners to face trial in the Arsenal in nearby Paris. In Charlatan, the prison is central location. 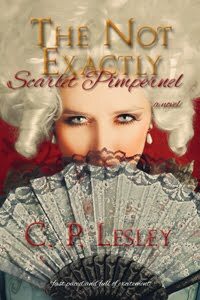 It is here that La Reynie’s assistant Louis Bezons is drawn to the daughter of La Voisin, a key figure in the Affair of the Poisons. It is also here that the magician and confidence man, Lesage, tries to find a way to stay alive while men and women he has worked with are brought to trial and executed. As the scope of the investigation grew, security was a problem at the prison—prisoners were able to communicate with each other and with the outside world—and desperate people, with time on their hands and urgent desires, can make wonderful characters. 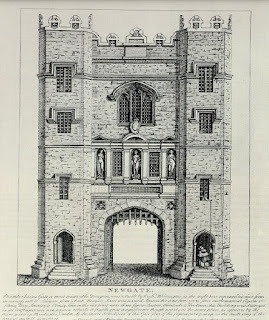 In my second novel, The Road to Newgate, London’s famous Newgate prison is an often-visited location for my characters, sometimes as visitors, but also as inmates. Newgate was notorious for the poor conditions prisoners experienced—unless, of course, they had money. The prison was first built in the 12th century and then, as a casualty of the Great Fire of 1666, it was rebuilt by Sir Christopher Wren. In the 17th century, Britain was in transition. Many aspects of society were advanced and modern but in terms of crime and punishment, things were fairly medieval. Heads were still displayed on spikes and traitors were hung, drawn, and quartered. The sounds and smells of Newgate are an important aspect in my efforts to create a believable picture of life in London at this time—warts and all. Here’s an excerpt from The Road to Newgate, with one of my characters, William Smith. He has just been arrested and taken to the prison. 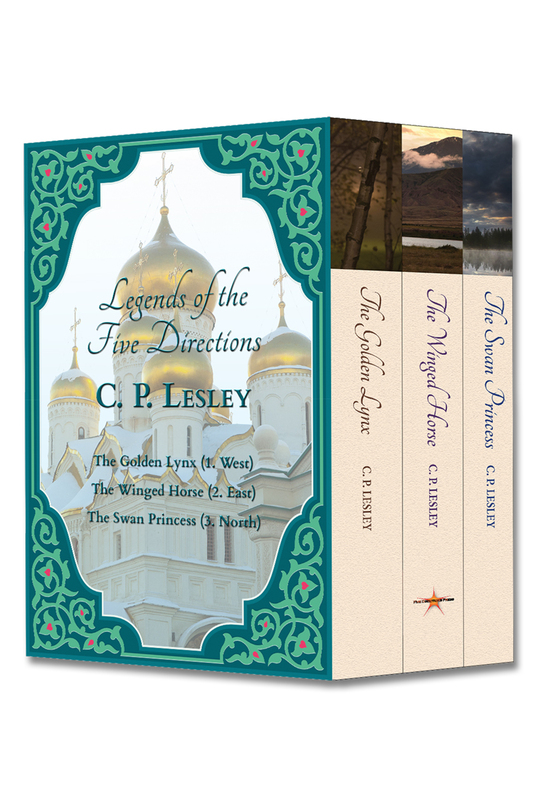 Among the many challenges (and joys) of writing historical fiction, is the need to convey the time period naturally within the story. Conditions in prisons vary drastically from country to country and from century to century. Small details can be very telling. The same is true of how societies treat people with mental illness. Another plus I’ve found in writing scenes set in places of confinement is that characters are never at their best when they have lost their freedom. They might be frightened, they might be angry. They may be innocent or guilty, sane or insane. Taking away a character’s freedom and seeing how they respond is a fascinating way for a writer to explore a personality. And stories where characters face conflict and strife will always have the potential to explode onto the page. 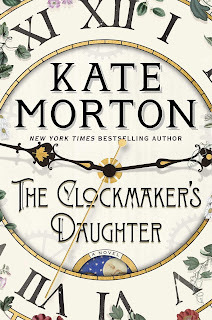 Kate Braithwaite is the author of two historical crime novels set in Europe in the 17th century but is jumping century and continent for The Girl Puzzle (Crooked Cat Books, 2019) to explore the life of Nellie Bly in 1880s and 1920s New York. Find her on Facebook, Twitter, and on her website/blog. 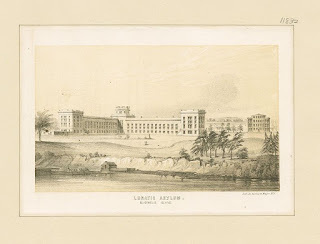 Images: Chateau de Vincennes, Newgate Prison, and Blackwell Island Lunatic Asylum, all public domain via Wikimedia Commons. 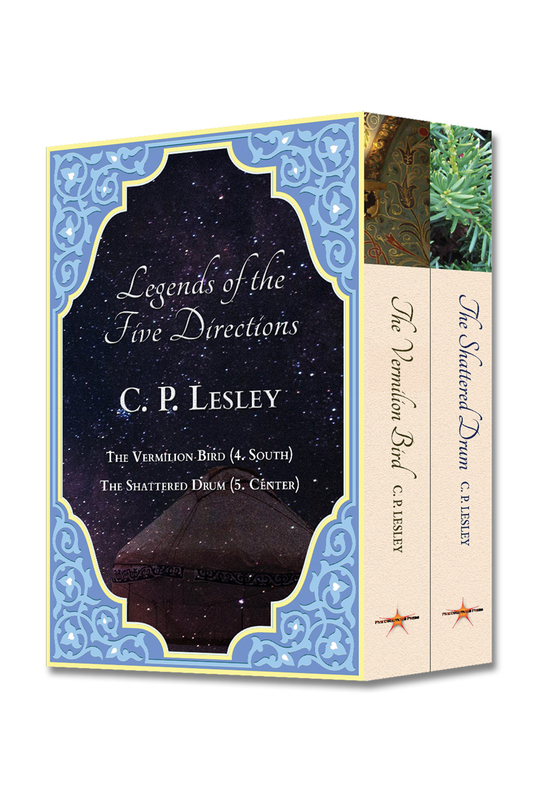 We rarely publish interviews back-to-back on New Books in Historical Fiction, but in this case the scheduling made it essential. I’ve had a chance to speak with Bernard Cornwell several times now about his bestselling Saxon Tales (also called the Last Kingdom series after the television series based on it). He’s a thoughtful and engaging writer, and interviewing him in print or in person is always a pleasure—a privilege, too, given his extraordinary success. So when his publisher asked if we could run the interview on the simultaneous UK/US release date of his newest novel, I agreed. It was no hardship. War of the Wolf has charms of its own. 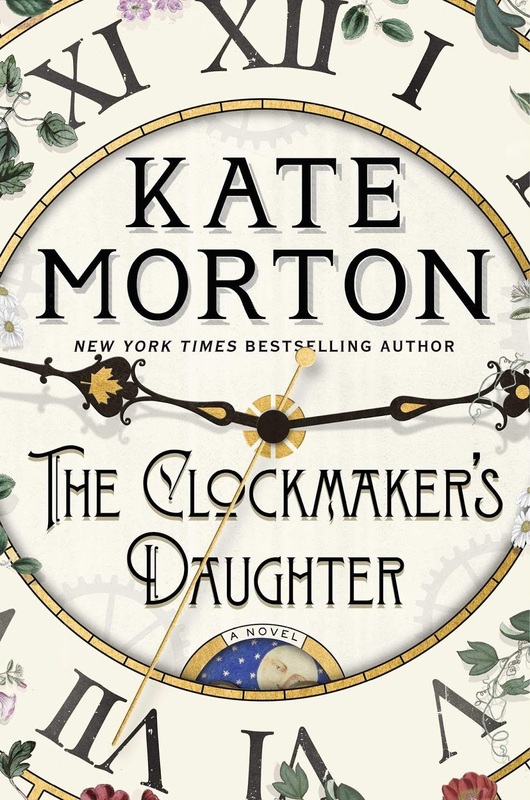 As the eleventh in a series that already spans more than fifty years, it must cope with the challenges posed by time: both the need to develop its main character steadily throughout his extended life span; and the need to keep the story line of each book new and interesting even as the long arc of the series as a whole draws to its close. The novel succeeds at both tasks. I won’t say how Uhtred moves on from the position he reached at the end of the tenth novel, The Flame Bearer, because that would spoil the plot of that book for new readers. But I will say that War of the Wolf still managed to surprise me. Although few of the characters we met in The Last Kingdom survive into this latest novel, the vast sweep of the larger story extends into a second and even, it seems, a third generation. The pagan Danes remain undefeated, and the antagonist here appears in a guise Cornwell admits in the interview that he has long avoided. And perhaps most impressive in a novel so focused on war at its most hands-on and brutal, his hero, Uhtred of Bebbanburg, continues to evolve. Once a brash young recruit, to borrow a modern term, who succeeded as much by luck as by skill, he has become a seasoned commander without losing his inimitable sass. And in an unplanned but fascinating coincidence, toward the end of the interview we discuss a topic that, although somewhat peripheral to Uhtred’s emerging England, is quite closely tied to last week’s interview about Leslie Schweitzer Miller’s Discovery: the question of priestly celibacy in the Catholic Church. Historians and historical novelists, but perhaps not so much the general public, have long known that between Emperor Constantine’s endorsement of Christianity as the state religion in the fourth century and the High Middle Ages approximately nine hundred years later, most priests lived with either wives or mistresses. The enforcement of celibacy in the priesthood by the church hierarchy took a long time to complete. The famous lovers Héloïse and Abelard—he a canon and she the niece of one—were caught in that transition. Now, Jesus of Nazareth belonged to a different time, one in which many people in the Roman-run province of Palestine held the apocalyptic view that the Last Days were at hand. By the fourth century, never mind the twelfth, it had become clear that the Second Coming would be delayed. So the views common among the medieval priesthood should not be construed as evidence that Jesus himself married; he may have considered earthly ties a distraction from the greater enterprise of salvation, as many of his followers clearly did. Or he may have married years before he began his ministry, as most young Jewish men did, only to lose his wife or leave her for what he perceived as a higher cause. It’s unlikely we will ever know for sure. But either way, no one can entertain doubts about where Uhtred stands on the question of celibacy—and of Christianity more generally. And if you do wonder, reading War of the Wolf is an excellent way to find out the answers. As seems appropriate for a character as resourceful, skilled, and self-confident as Uhtred of Bebbanburg, he goes from strength to strength. In addition to a set of bestselling novels, collectively dubbed The Saxon Tales, Uhtred has a television series to his name: The Last Kingdom, just renewed for its third year by Netflix. 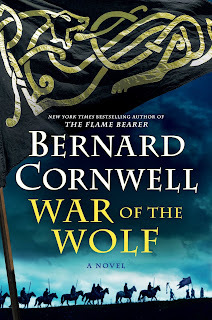 Here in his eleventh adventure, War of the Wolf (Harper, 2018), Uhtred should be enjoying the fruits of his labors over the last ten books, but of course, that story would be no fun to read or to write. Instead Uhtred, now past sixty, receives a summons to travel south to protect the fortress of Ceaster (Chester) on behalf of Aethelstan, the son of King Edward of Wessex. Uhtred soon realizes that the summons is a ruse: the greater danger lies in the North, in the person of the Dane Sköll and his warriors, who dose themselves with henbane to harness the power of the wolf. 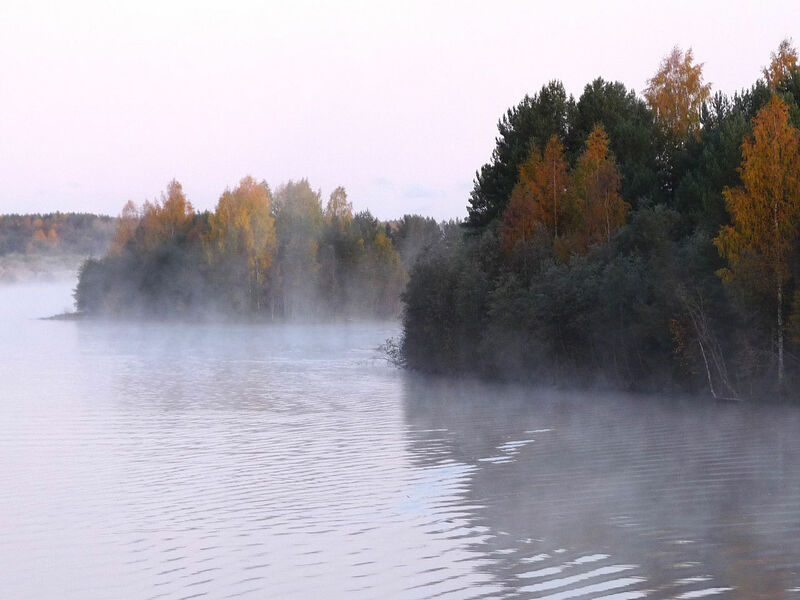 Sköll also has the support of a powerful sorcerer, who Uhtred comes to believe has cursed him—especially after Sköll attacks the city of Eoferwic (York), where Uhtred’s son-in-law rules, with devastating effect. 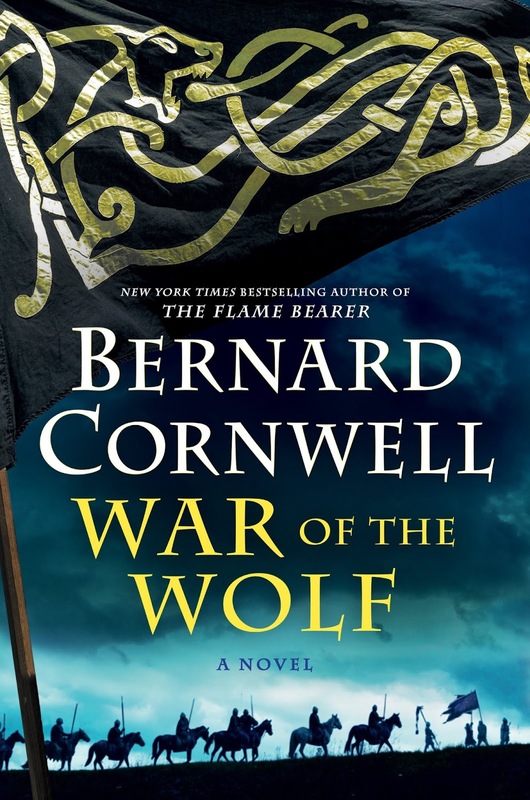 Bernard Cornwell does not disappoint, and this latest entry in the Last Kingdom saga sees Uhtred at the top of his game and England a bit closer to its eventual unification, a goal that Uhtred both supports and fears as it becomes ever clearer that his kingdom, Northumbria, and his pagan religion increasingly pose the only barriers to King Edward’s success. 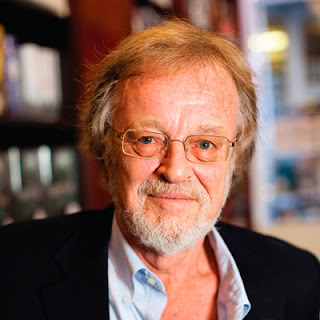 For my two previous podcast interviews with Bernard Cornwell, see New Books in Historical Fiction for June 2014, The Pagan Lord, and December 2016, The Flame Bearer. Our written Q&A about his non-Uhtred novel Fools and Mortals appeared on this blog on January 12, 2018.